SCOTTSDALE, Ariz. – Jan. 12, 2018 – To once again honor Barrett-Jackson’s Scottsdale Auction, Scottsdale Mayor W. J. 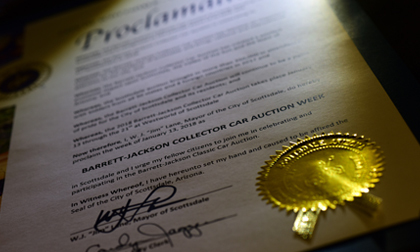 Lane has officially declared January 13-21, 2018, “Barrett-Jackson Collector Car Auction Week.” It is the 30th year the mayor of Scottsdale has given the proclamation to the World’s Greatest Collector Car Auctions®. Heading into the 47th Annual Scottsdale Auction and 30th year at WestWorld of Scottsdale, Barrett-Jackson is one of the highlight events of year, attracting bidders from all 50 states and dozens of countries around the world. In 2017, the event saw more than 320,000 guests pass through the gates and sold 1,719 vehicles, totaling $102.5 million in sales while setting 40 world records. The auction also saw megastars Steven Tyler, Justin Bieber, Floyd Mayweather, Michael Phelps and many others in attendance. One of the top headlines heading into the 2018 auction is the announcement of Barrett-Jackson’s yearlong charity initiative, “Driven Hearts,” benefiting the American Heart Association by helping raise money and bringing awareness to promote heart health. The initiative includes the charity sale of a 1988 Chevrolet 35th Anniversary Edition Corvette at the auction, along with the sale of the first state-issued Barrett-Jackson themed license plates and other on-site activations throughout Barrett-Jackson’s four 2018 auctions in Scottsdale, Palm Beach, at Mohegan Sun in Connecticut, and Las Vegas. The nine-day event kicks off with QuikTrip Family Value Day on Saturday, Jan. 13, with free admission for children under 12. The popular invitation-only Opening Night Gala will be held on Sunday, Jan. 14, with the automobilia and collector car auctions beginning Monday, January 15. The event will once again feature a comprehensive automotive lifestyle experience with a variety of activities, including the Ford Ride ’N Drives, Chevrolet Hot Laps and Dodge Thrill Rides. Complimentary “Behind the Hobby” Collector Car Symposiums will be offered throughout the week, along with a Restoration Garage, Motor Trend Live Stage, hundreds of exhibitor and sponsor displays, and – new this year – STEAM City, a fun and educational experience including interactive demonstrations and hands-on activities to engage kids and families in areas of STEAM: Science, Technology, Engineering, the Arts and Math. The 2018 Scottsdale Auction docket is now available to view online. Click here to consign a vehicle or visit Barrett-Jackson.com/Bid for information on becoming a bidder. Advance tickets, all-event ticket packages and information on VIP Packages are available at Barrett-Jackson.com. Also, follow Barrett-Jackson on Facebook, Instagram, LinkedIn and Twitter for the latest news and information heading into the 2018 Scottsdale Auction.